Did you wake up this morning thinking, “I wish I had a dentist appointment to go to today?” Probably not. Although it is certainly not a desirable activity, the reality is we need to acknowledge the significant role dentistry plays in our overall health and quality of life. 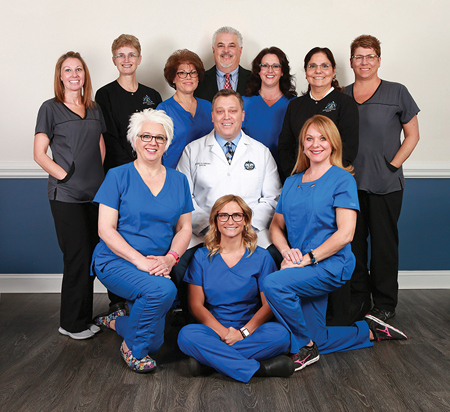 Located at 851 Old Winston Road in Kernersville for the past 17 years, Dr. Jesse A. Grimm, DDS and his staff have been providing patients in our area with the professional care they have grown to appreciate and respect. This starts with their initial checkup appointment where a thorough and comprehensive dental examination takes place. In addition to checking for tooth decay, the exam will also evaluate the health of your gums, perform a head and neck examination (to look for anything out of the ordinary) and examine your mouth for any indications of oral cancer, diabetes, or vitamin deficiencies. X-ray images aid in determining issues beneath the surface of your mouth and others problems that might not be visible to the naked eye. Prior to opening his practice, Dr. Grimm established a 11-year extensive dentistry background, where he developed his skills and experience working on patients to develop the most effective techniques to get the job done and causing the least amount of discomfort for the patient. Today, the long-term relationships the practice has established with their diverse client base speaks for itself. Dr. Jesse A. Grimm and his staff provide patients with a wide range of personalized cosmetic and general dental services for all their dental needs. Some of the services offered beyond teeth cleaning and dental fillings for cavities include working with crowns and bridges for a severely damaged tooth, treating bones and gums for periodontal disease, dental implants and dentures for missing teeth, and root canals when a cavity has reached the pulp of a tooth causing an infection of the nerve. The success of Dr. Grimm’s practice is a unique blend of medical expertise along with a proactive caring group of team members who have a passion for providing a high level of quality patient care to anyone who walks into their office and is looking for a caring dental team and a stress free environment. For Dr. Grimm and his staff, providing the best care starts with carefully listening to what their patients’ concerns are, followed by educating and reviewing all the options that are available for a specific issue or for a long-term approach. Operating the office in an efficient manner is also an important consideration. Respecting patients’ time as well as their resources (and budget) is a top priority, knowing just like each medical condition, everyone has uniquely different needs. The staff takes time to develop a personal treatment plan that fits into each patient’s schedule and budget as well as a plan that is prevention oriented to keep the patient from needing more extensive dental treatment. With these core values there is also no surprise that Dr. Grimm seeks out the latest industry updates through continuing education. He enjoys bringing new technology anchored in scientific based treatments and procedures into his daily practice to further offer better solutions for his patient’s needs. One example is his use of a DentalVibe which is a small, handheld wand that uses vibration to stop pain caused by injections. Even for patients that are not afraid of needles and shots, DentalVibe allows the skin to absorb and spread local anesthetic more efficiently. Dr. Grimm takes great pride in his practice, his community, and his family. Patients appreciate the wide range of dental services he can personally provide and it is humbling when the patients he began seeing as children, are now bringing their children in for checkups. To encourage good oral and dental hygiene early, Dr. Grimm offers a ‘No Cavity Club’, where any patient age 17 and under who is cavity free at their 6 month hygiene visit can be entered into a drawing to win a prize. Dr. Grimm and his family enjoy living in this area where his wife grew up and he takes comfort in the closeness they all share. His wife Tonya was a dental assistant before she became a stay-at-home mom to raise their three children who were all home schooled. Jaron and Brody are currently in college and Lexi is finishing up high school. The dental office of Dr. Jesse A. Grimm, DDS is currently accepting new patients. To learn more, visit their website at www.jagdds.com or call their office at 336.996.7770 to schedule an appointment. It is worth a great smile!